Like most people who commute, I end up reading the Metro every day. If it was a paper that I had to pay for, I probably wouldn’t read it, because it’s just so bad! You can definitely tell it is owned by the Daily Mail’s company, from the tone of the stories. In the last few months, there has been a bit of a shake up of the central sections, with a bit of a redesign (thankfully not so much on the iPad app) and some new sections added in. One of the ones that was added was a tech section. I don’t think it’s any secret that I’m a bit of a nerd, so I was quite happy to see this new addition. Until I actually saw it. There’s usually a large story, then a smaller section where items are reviewed. The larger section is usually talking about some new technology or some sort of event, so things like what was shown at CEX, the Boeing Dreamliner 787 and its rival, the Airbus A350, and how cloud technologies will be used have been featured recently. So far, so good. It’s aiming at a wide audience, so it’s not going to be overly techy, but the articles in this main section are more likely to encourage further reading if you were interested. The smaller section is called “Gadget Girl” and is (obviously) written by a female – which, if you haven’t seen the section might seem like an irrelevant thing to note. The writers full length photo takes up about half as much space as the article itself – I have to wonder if this section was written by a male, would the same size/style photo have been used? When I first noticed this section, it was just after New Years, and was reviewing items that can help you lose weight. (How cliche) I say reviewing, but it sounded more like a rewrite of a press release. That’s a pet hate of mine on blogs, but in a national newspaper where someone is getting paid to write? Ridiculous. I had hoped that this was a one off, but – well, here are the past few weeks worth of columns. 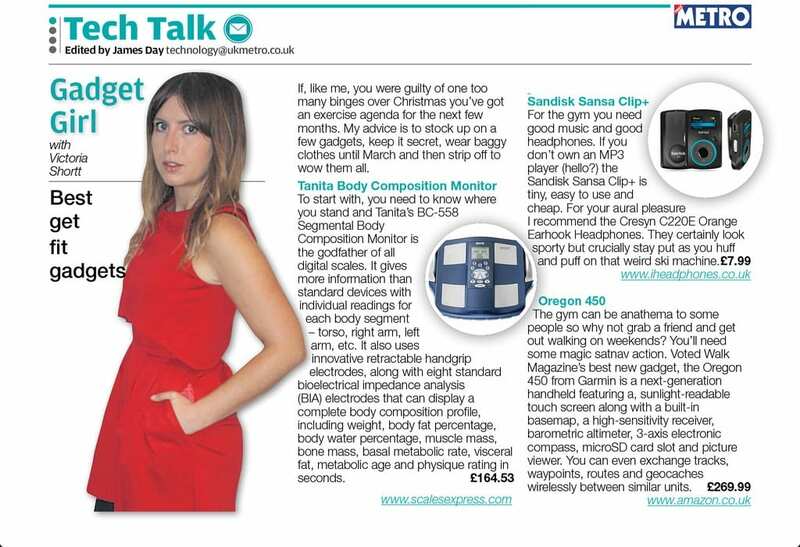 Detoxing – so a juicer, a blender and a light treatment device to help your skin were talked about. Valentines day: I can’t even. With this section, Metro has both insulted women that understand and enjoy new technology and journalists who probably would love the opportunity to write for such a large audience. 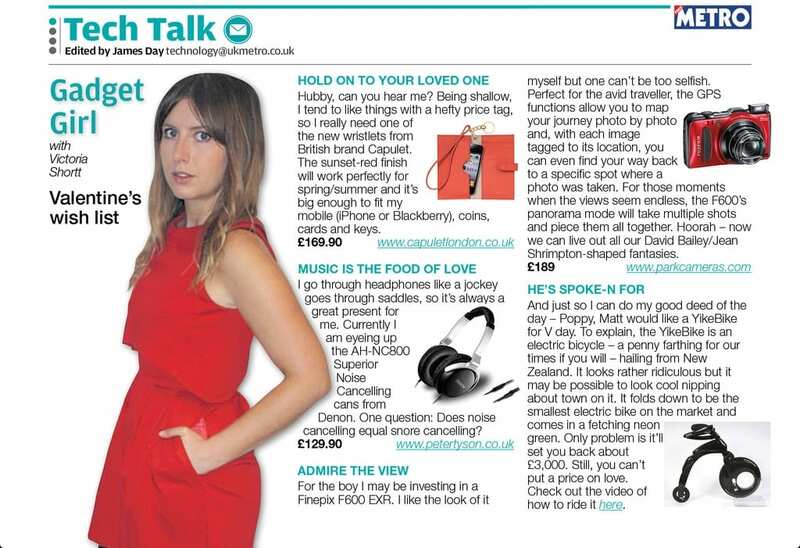 Even non journalists actually – hey Metro, I’m available for hire! I love tech! I can wear a pretty dress and look rather nonplussed at the camera! I think I’ll just have to go back to reading Wired and .net. Haa. I remember when I did my journalism course we used to bring in the Metro every day as an example of how not to write/what not to aspire to! 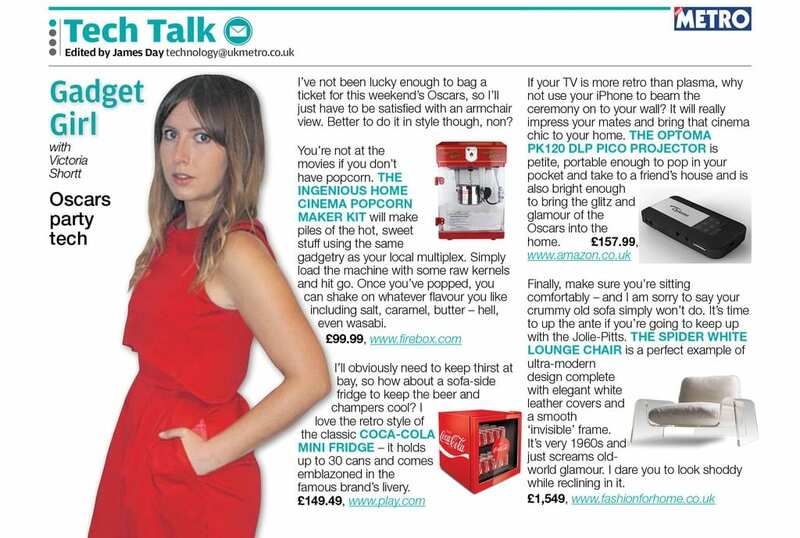 Oh my Lordy – I read the Valentine’s Day one and I completely agree – personal shout outs, pouty model, sorry, journalist (? ), and snooty, unhelpful tone – haven’t read that section since. Wow. I’ve given up on Metro since getting my Kindle and because it’s dire (Metro, not my Kindle). 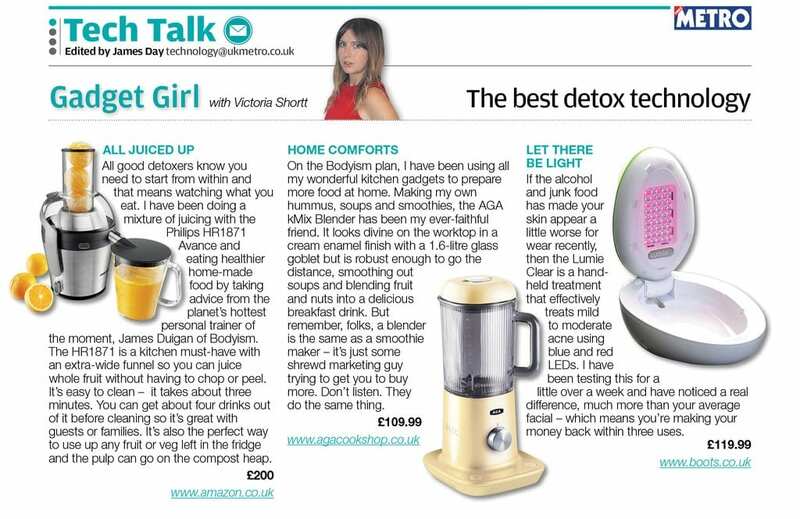 That column is pure DM, “Let’s make ourslves look good by having a woman writing about Tech, but bear in mind everyone, girls only like things that are pink, designer or helps them lose weight lol!” A juicer and a Lumie clear, really? Is that all we’re limited to now? That photo of the ‘journalist’ is awful. Is she supposed to look cool and nonchalant? Her expression says she’s just been accused of farting in a lift full of strangers. Urgh ridiculous articles. The metro really is the worst! Um, who is the target audience here? 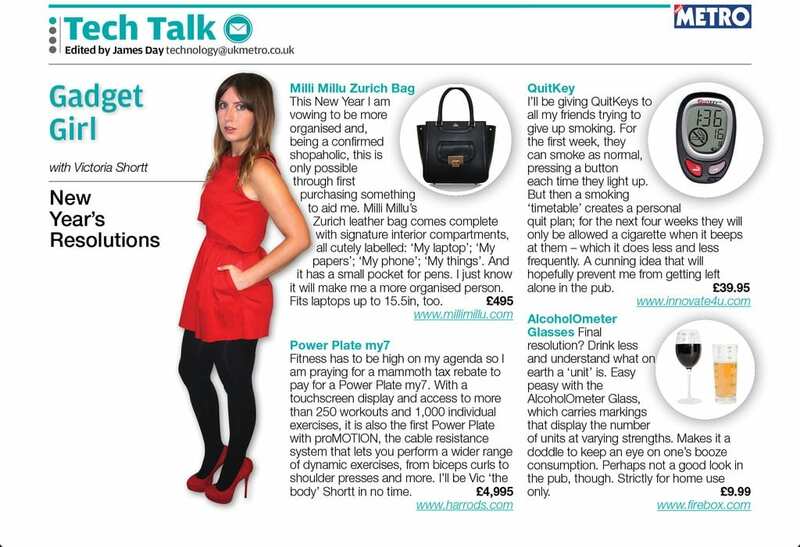 I can’t think of many metro readers who have five grand to spare on a power plate. It’s a tad insulting that they think these are the type of gadgets women want to read about. Word of advice – don’t have a go at others’ journalism until you can master basic punctuation like apostrophes. Sort of undermines your argument ?? ?The writers full length photo ???? A missing apostrophe is far less offensive than gender stereotyping. Aaaah, the multiple question mark. The sign of a great (Metro) journalist. I see that you left this comment while using an associated.co.uk connection. As I’m sure you already know (but for the benefit of those who don’t) Associated Newspapers Ltd is the owner of the Metro. Perhaps in your reply, you could actually respond to the blog post and various comments above instead of a missing apostrophe. If we’re being pedantic here a journalist should never use ‘?????? ?’ and certainly not more than once in a 3 line comment !!!! Those who have mastery of basic punctuation tend not to use 3-4 question marks where one would do; when quoting someone, they use quotation marks. They also know not to use partial sentences such as “Sort of undermines your argument”. You’ve undermined your own argument, there. Hayley’s argument about sexism is in no way undermined by the minor grammatical error to which you refer. I think your argument would be a little more solid, Michael, had Hayley been criticising the use of punctuation in the Metro. You are completely missing the point – the issue here is about content, not pedantics. Also, using three question marks – on two occasions – is not really showing an understanding of basic punctuation. Unless you are a 12 year old on MySpace. Great post! I’m a female tech/design blogger and I’ve never reviewed such products on my blog. 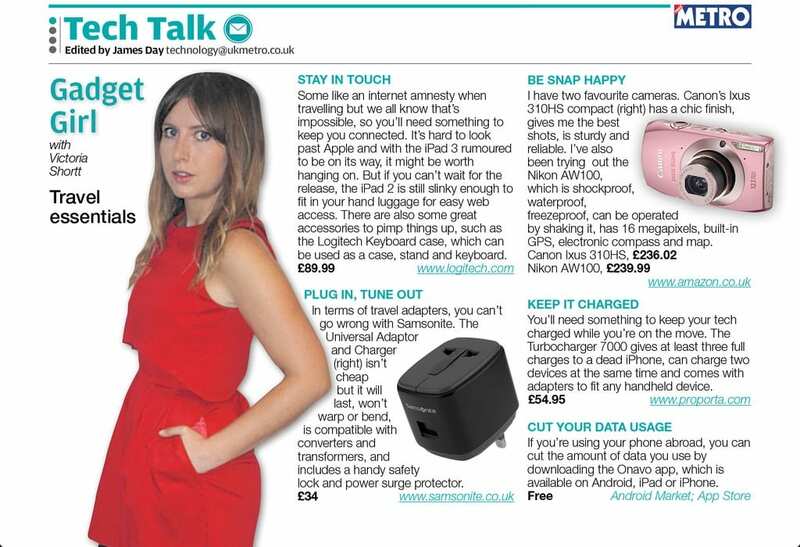 A couple of articles containing girly gadgets is OK but not every single article. Poor show Metro! Gosh Michael Singer, but I reckon you pull off the achingly difficult task of proving Hayley’s point with admirable aplomb. The light treatment device looks like a toilet.